Balls-to-the-wall power here, an enveloping BA that's elegant and not voluptuous, with creamy-malty flavors but even more lovely, with slatey-apple flavors; almost tenderly vinous primary fruit-slate notes that don't have to impress you since you're already melted. One of the greatest sweet wines of the vintage. 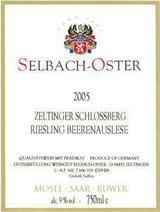 A tangy dessert Riesling, this matches candied lime, mint, apricot and cream notes with sweetness and a lively structure. Well-integrated and elegant, with a mouthwatering finish. Lovely expression of place. Best from 2009 through 2040.